Creativity Humor Growth ☺CHG☺ Claudia H Gruy Writer's Burrow: For Easter prep I asked: Why do you write? For Easter prep I asked: Why do you write? IDEAL. It’s one of the most accessible & portable creative passions in the world. You can do it anytime, anywhere, either alone or around others. INTUITIVE & CLEAR. It puts you & keeps you in intuitive awareness & perception, in creative flow: if you’re having a bad day it instantly uplifts you if you let it, both through releasing doubts and fears, helps you gain clarity by just being able to lay everything out and see it all on the page and keys you into the true opportunity of learning by showing you what you are really resisting. PERCEPTIVE. Your journal is a constant companion that listens without judgment, allowing you to see and accept yourself in quite no other way: writing keeps you authentic. PRODUCTIVE. You can write even when you are sick: you can still squeak out some pretty decent stuff and hey you get to stay in bed AND still be productive. PURE RELEASE. It’s the perfect way to lose yourself in the play of words & ideas. UNLIMITED REACH. Writing is one of the most effective, efficient ways to get your creativity out there, connect with like minds and inspire an unlimited audience. And it’s always out there reaching people 24-7 once created. It’s one of the perfect vehicles for unlimited reach especially if you are online. FUN. It’s just fun, pure & simple. 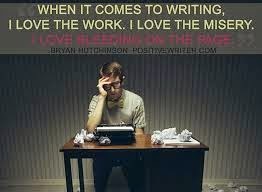 I’ve never met a writer yet who doesn’t secretly & seriously love what they do. INSPIRATIONAL. Writing uplifts & inspires. Even on the rainiest day, or when you don’t have a lot of time, or get caught waiting. You can carry a notebook and pen wherever to catch those ideas. CREATIVE POWER. When you put your dreams, desires, visions & intentions in writing they tend to happen, often all on their own. FOCUS. Writing trains focus, which in this world, is one of the most important skills you can possess. VOICE. Writing brings out your voice which once you get a sense of ultimately empowers you AND the world. INTRIGUE. There are so many genres, you’ll never get bored, plus exploring new genres not only strengthens and empowers your creative voice, it enhances your writing skills. STYLE. You are free to develop your own style and rules – it’s an open canvas to be as creative as you are inspired to. PERSONAL DEVELOPMENT TOOL. In addition to giving you your own 24-7 access to your intuitive voice & skills, a journal can be the best listener you’ll ever find allowing you unlimited access to your deepest dreams, desires, aspirations & motivations. There’s nothing quite like it to reveal exactly what you think and feel. LINE OF THINKING. Unlike just thinking, writing out your thoughts allow you to explore a particular line of thinking, which usually gets cut short by some immediate external stimulus or distraction, or by an associated idea or line of thinking. Such exploration is the key to understanding & realizing the potential of a particular creative idea or inspiration, which might otherwise have been missed. ZONE. There’s no better feeling than just letting loose on the page, the ecstatic rush of anticipation of what is going to emerge next, when you lose yourself in the free flow of writing, in the absorbing intoxication of words. CREATIVE. It’s an amazing way to create and to share your message, your life’s motivation with the world. PLEASURE. Not only is writing so pleasurable to the author, it gives so much pleasure to others. IMAGINATION. Writing is the most fun way to stretch & exercise your imagination, whenever you want or need it: the perfect excuse and permission to indulge. Yeah, writing is SOOO much fun. right. Celebrating my first blog comment! A HAPPY EASTER FELLOW WRITERS! !